In today’s post I will be reviewing; Cosmic Shimmer Vintage Mica Flakes by Creative Expressions. Item number: Tarnished Bronze; 055260 904440. Precious Gold; 055260 904457. Luna Silver 055260 904433. RRP at time of writing: £3.65 each. I bought mine as a set of three on Create & Craft. Impulse! I am not a fan of glitter because it gets everywhere and I have a lot of static so this makes it worse. THIS on the other hand has much larger flakes. 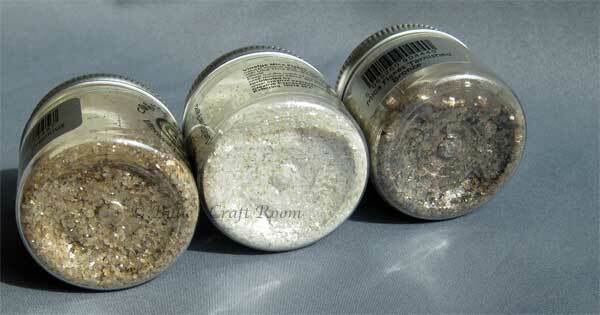 I saw these Mica Flakes demo’ed on Create and Craft by Sue Wilson and they seemed much heavier than glitter and gave a dazzling result. I want to use them with a series of different mediums and experiment, I could see a lot of possibilities with these. I also liked that they were more vintage colours rather than bright or candy colours which isn’t my style. The flakes vary in size which adds a nice dimension to projects too. Lovely vintage colours, I can see more potential for my uses for these than with bright or candy colours that glitter often comes in. The gold is a nice soft old gold kind of colour, the silver is more like soft pearl and the bronze is a warm version of autumn leaves. Tricky to photograph, but they are totally lush! Cosmic Shimmer; Vintage Mica flakes. Precious Gold, Luna Silver, Tarnished Bronze. Nice, I like the variation on flake size and the vintage colours. The pots have a nice wide opening making it easy to pour any unused flakes back in. 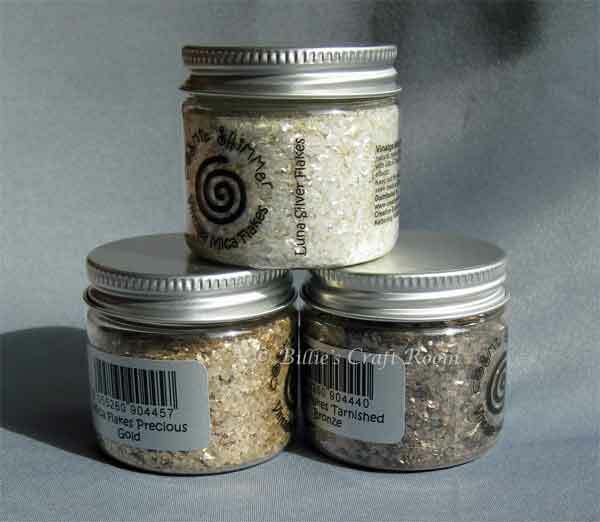 The jars have well-fitting lids that hold well but aren’t difficult to open. Fair. You get lots in the little pots, and a small amount goes a long way. Ask me in a few months. I’m not a big one for glittery things, so I need some time to get used to the concept and how I’ll incorporate them into my style. This was a leap of faith for me, I wanted to add a more textural dimension to my projects and experiment with more colours. When I’ve had more time to play and experiment, expect to see more projects and tutorials using this product. I can see a lot of potential for this and look forward to finding out what more I can do with it. In today’s post I’d like to share the latest page created for my advent calendar project. 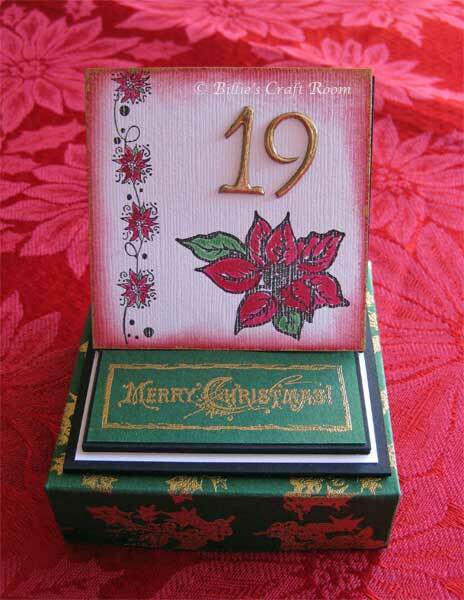 I’d love to see your results if you are making daily pages for a similar advent calendar. If you missed the tutorial at the start, here’s Part 1, which contained a download for how to create your calendar. Hope you like this project and will join me tomorrow for the next page. Today I would like to share a picture of the stampbord necklace that I made just before Christmas. It features a Holly theme. Ink Used; Tsukeneko Versafine in Onyx Black. Stampbord in Domino sized Pieces. 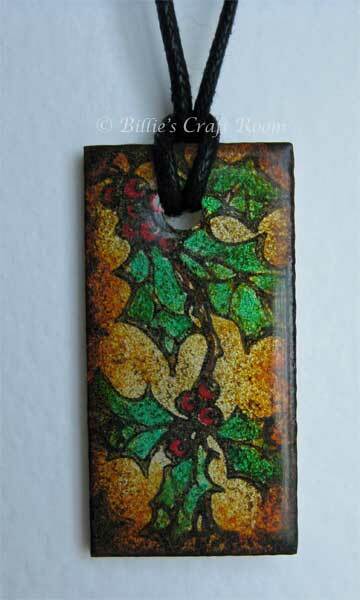 These necklaces are such fun to make, the acrylic paints work beautifully on the surface and dry fast too. The Versafine ink dries perfectly over the Fluid Acrylic paint. I use a Crop A Dile to make the hole for the cord. The cord I’m using is 2mm cotton cord, it is made by Impex. Adding a few layers of UTEE (Ultra Thick Embossing Enamel) in clear, over the top of the paint, has given a superb sheen and really made the colours pop. If you haven’t tried stampbord yet, do give it a try. It is one of those things that people are afraid of trying, but it is super easy to use. I highly recommend using the Versafine ink with it, as it is a really black, black 😉 and dries superbly. My top tip is to ink your stamp then lay the stamp on the desk, and take your piece of stampboard to the stamp. Really go for it, be brave, pounce and then press firmly to ensure the stampboard has full contact with the stamp. Hold the stamp down with one hand, grip the edges of the stampboard with your other hand and pull straight up. This avoids the chance of skidding your stampboard across the stamp and blurring your image. You can colour stampboard with inks, pens, pencils as well as paints. Adding UTEE as a final layer will help seal in your work to protect it from scratching, but is an optional extra. If you haven’t got a heat tool and UTEE, try just stamping onto it. It’s great fun and a superb surface to ‘play’ on. Today I would like to share a picture of the card I made for the Stamping Mad Forum card swap for May 2009. The theme was Paint. I would like to share the card I made for the Stamping Mad Forum’s Christmas and Yule card swap. DH helped me create an insert in Word for the inside of the card, which gave it a nice professional finish. Today I would like to share some pictures of the Christmas Lanterns that I made last year. They are created from rubber stamps. You repeat stamp the image and then assemble them. I have used Twinkling H20 paints to decorate them as it has a great sheen to the paint due to the high mica content. I added beads to the centre wire for added interest and ribbons at the base of the ornament. These are the Petite version of the stamps and make small ornaments, I hung them from organza ribbon and from a swag that we put on the banister of the stairs. Best wishes and thanks for reading, see you soon. October’s theme for the Virtual Crafting Challenge has been ‘Lots of Layers’. I have a few medallion stamps but haven’t really done much with them. 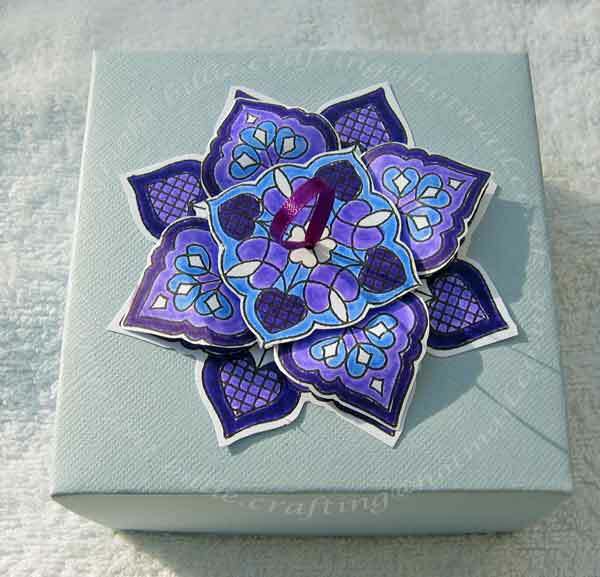 I had made a Jacob’s Ladder for MIL’s birthday and created a gift box for it to go in, so decided that a medallion would be a good way to finish off the gift box. I used the Heart Lace stamp from Creative Expressions and Versafine Onyx Black ink. I coloured the image using Emboss Dual Pens by Tsukineko in colours #36 Lavender, #35 Wisteria and #7 Pansy. The mat areas are just coloured in, the gloss areas had a layer of clear embossing powder applied over the ink whilst it was still wet and then heated. The ribbon in the centre is to act as a pull to easily open the gift box.